"In the end, this church will open to women’s full and equal participation. We are all doing our part to make that a reality." BlogJustice in the ChurchWhy Aren't Women Religious Superiors Voting alongside their Brothers? BlogJustice in the ChurchWho Will Draft the Synod Final Document? BlogJustice in the ChurchYoung Catholics Are Speaking Up. But will Bishops Listen? It is clear that if they seek a more vibrant church, they have no other real choices. A journey of discovery teaches lessons of worthiness and empowerment for a young woman in the Church. 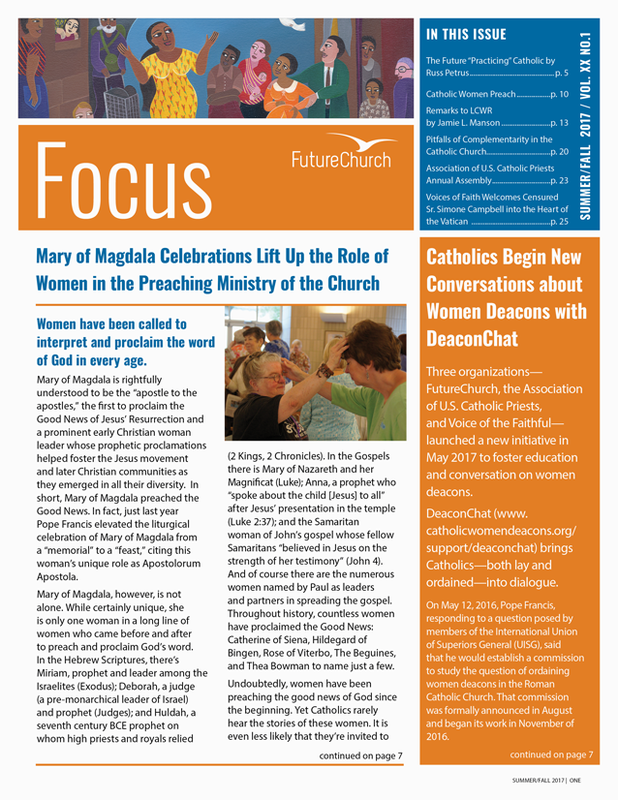 In 2016, FutureChurch expanded its teleconference series focusing on the restoration of women to the permanent diaconate and the challenge the Church faces as younger Catholics walk away in greater numbers. Liturgy of the Word lifts up voices of women in history, today, and tomorrow while praying for a Church for our daughters.